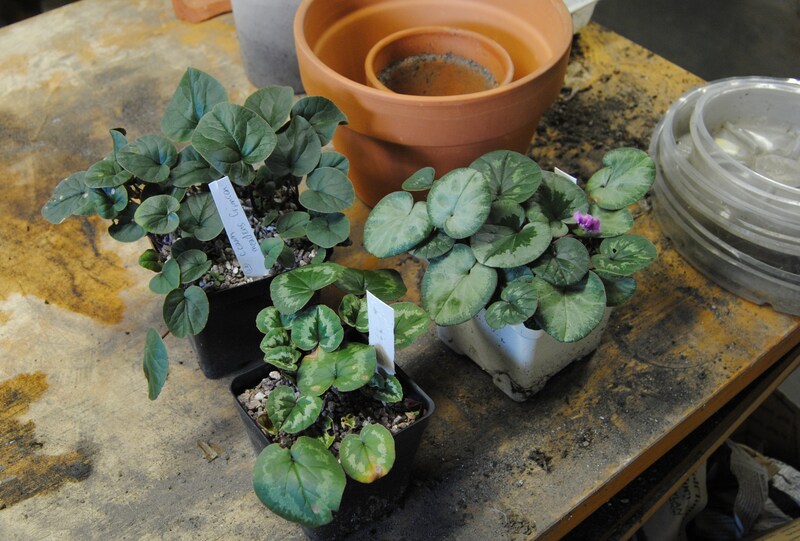 Cyclamen should be transplanted when dormant if possible. It’s easier and probably less stressful for the plant. I’ve found they don’t really care all that much and do it whenever the mood strikes, so when the mood struck last week (about two months too late) my little guys got roomier quarters. Winter blooming cyclamen coum was my target and this replanting is to get them ready to come indoors and brighten up my winter garden. C. coum is perfectly hardy outdoors around here (zone 5/6ish) and I only keep them potted because they’re so easy to grow and bloom in the back corner of our semi-heated garage. They’ll bloom throughout the darkest days of winter, unless for some reason one decided to start now. For repotting, a gritty good draining mix is perfect, but mine do well enough in a blend of 3 parts purchased potting soil mixed with about 2 parts sand robbed from the kid’s sandbox. Sometimes the kids complain, and the mix gets less sand. Replant the round bulbs with the top of the corm just at the soil surface and then cover it up with about an inch or so of gravel or grit. I prefer chicken grit since it’s easy to find around here and was the topping first recommended to me by Carol, my cyclamen mentor and enabler. Finished product. A few of the plain green ‘Meadens Crimson’ went into garden beds since winter garden space is limited, but this was a good start, and not as many plants as I thought, so it inspired me to take a leftover c. coum pot and bring them in too. How could I resist? I love the one with the ring of pewter patches, and the silver leaf with the small Christmas tree center….. also a favorite. It’s been a few days and the plants have settled in well outside. I feel like the cooler temps and good air circulation help avoid any rot or fungus, and I think the fact they are actively growing helps too, but untangling the leaf and bloom shoots is like separating Velcro. 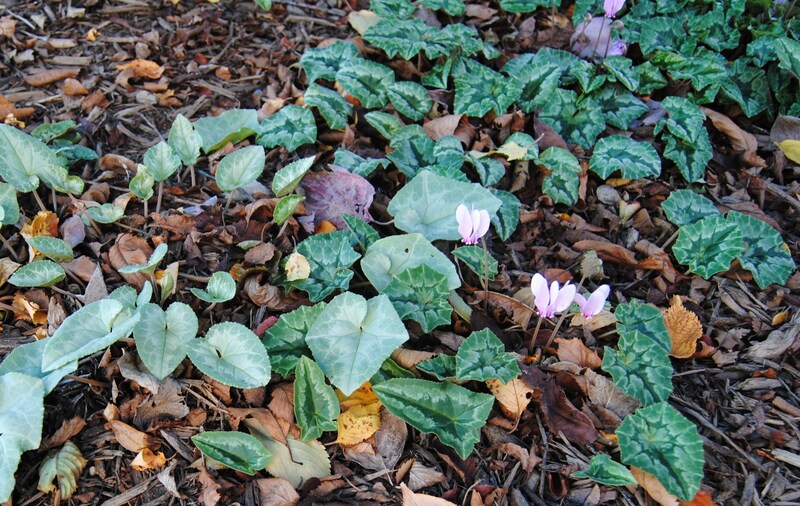 Most of the fall blooming cyclamen hederifolium will stay outdoors. There are still a few blooms coming up, but from now through winter it will be the foliage which steals the show. In this dark dry spot under a weeping cherry I’ve been putting a few of the too-large or excess cyclamens. They might be too close together. I think I’d prefer to be able to enjoy each different leaf pattern separately and some of the smaller plants don’t compete well with the bigger guys. I’ll just have to put that on the to-do list. 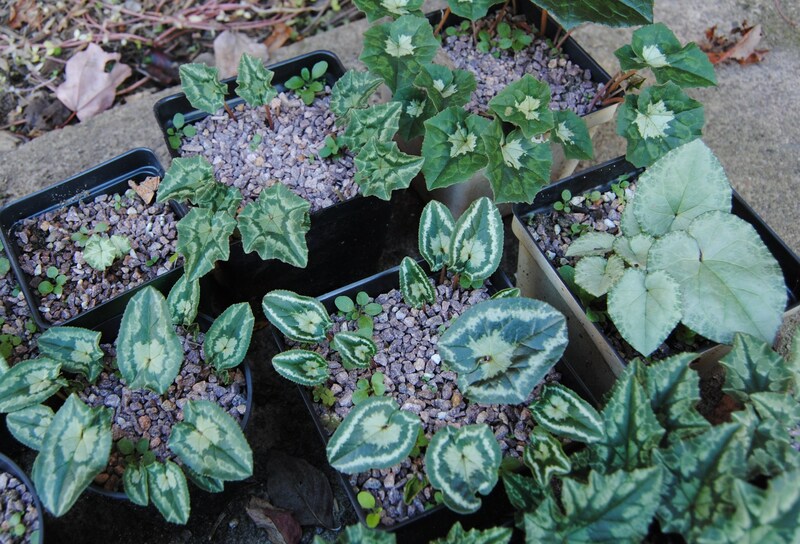 Also on the to-do list is finding homes for all the cyclamen hederifolium still in pots. Last year my brilliant idea was to pot them up individually so I could get the full effect of each separate plant and maybe take them all in under lights. Not enough room, so I tried to find a sheltered spot, dug in the pots and gave them a little winter cover and crossed my fingers. Most died either over the winter or during the summer, so I will not test that method again. These surviving treasures will either enjoy a winter garden spot or find a permanent planting bed. 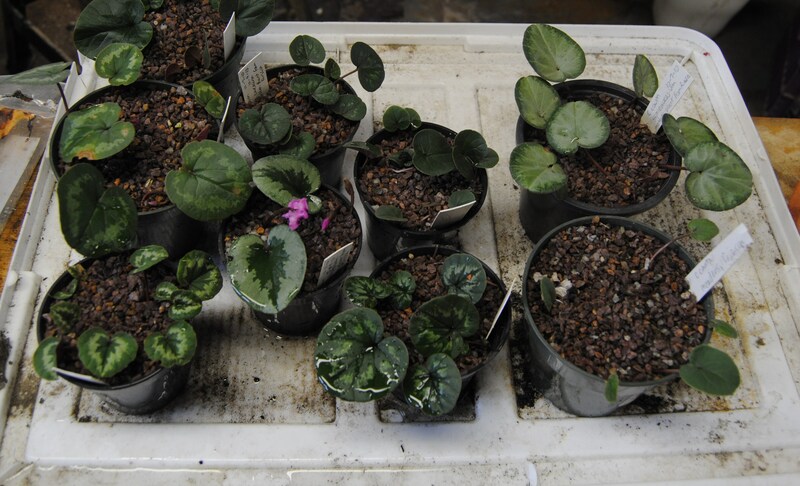 The plants near the center are from (like nearly all the other cyclamen) Green Ice seed, these were from the ‘fairy rings’ strain. I like how this one’s more silvery leaves stand out. Here’s one that develops a pinkish center as temperatures drop. This one will get a windowsill spot for sure. 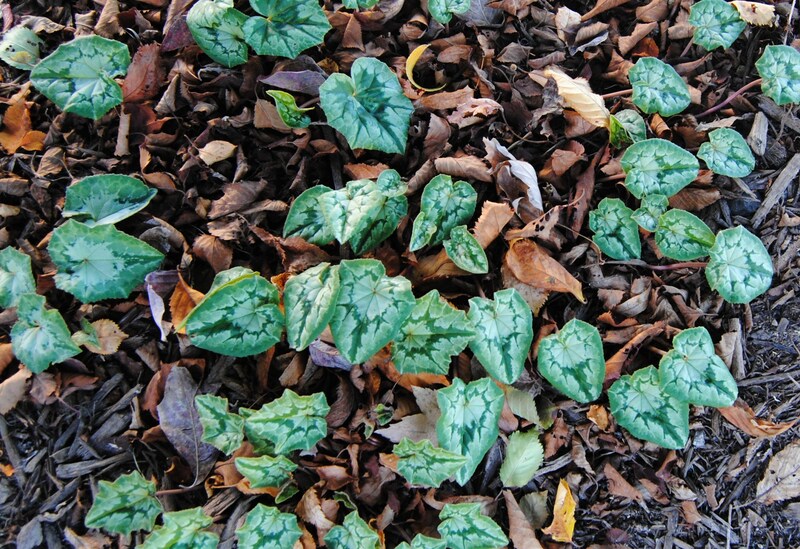 This entry was posted in cyclamen, fall, perennials and tagged attractive foliage plants, cyclamen coum, cyclamen hederifolium, fall perennials, hardy cyclamen, winter garden. The florist ones are great winter color for indoors but I also can’t keep them too long. Two months is about the most I get out of them, I guess the hardy ones are used to the abuse already and just shrug off drought and overwatering. Oh my word!! 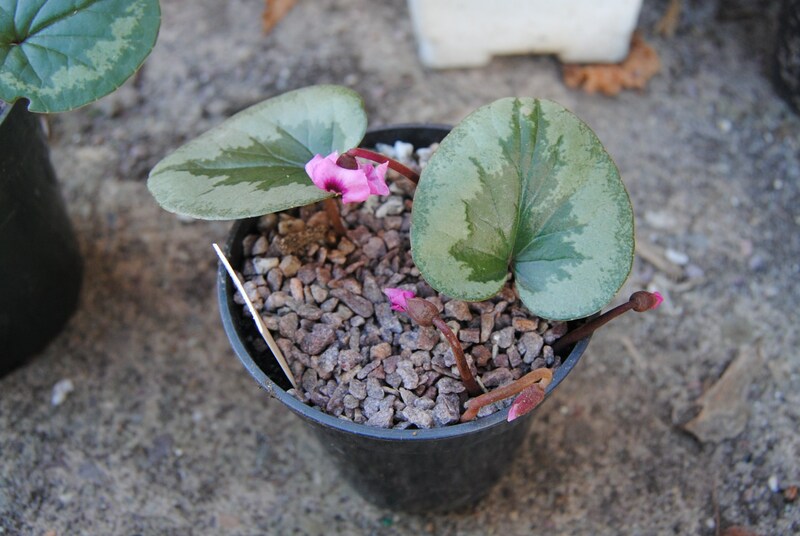 Your Cyclamen are gorgeous! If I had more room on my windowsills for winter I would try some of the hardy ones inside. I do have a C. persicum which is now either dead or dormant….I going with dormant for now ;-P Do you collect your own seed from them? If so I would love to try some of them…we could do a swap prehaps? And I would love to see all your posts on Cyclamen! Keep the photos coming! 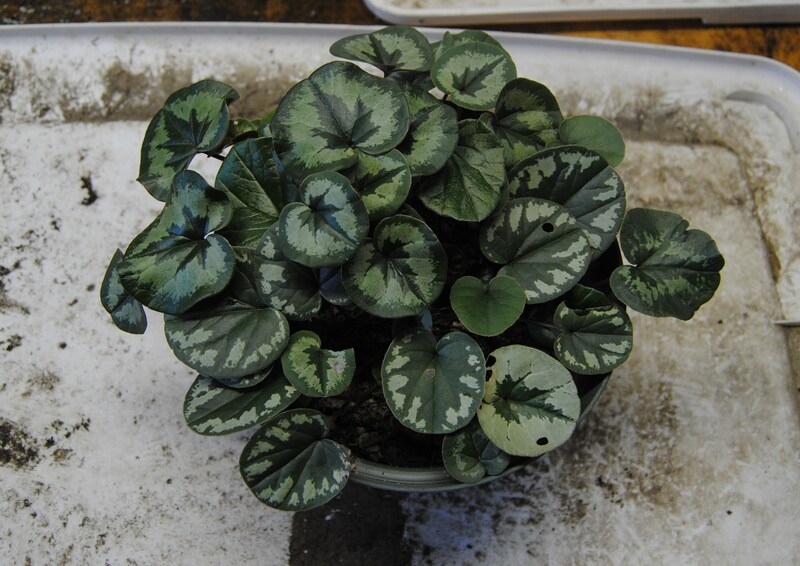 Also thanks for the Cyclamen seed link! It’s fantastic! Aren’t those seeds great? They don’t all come true to type but there’s always something good or better showing up. I don’t think I’ll have many seeds this year, I’ve been deadheading since the plants are still young, but next year there should be a couple I’ll collect from. I’d be more than happy to send a couple out. Maybe we could trade for primula seed, I didn’t know you were the celebrity behind the primula society’s seed exchange! Yep that’s me beavering away packeting, labeling and sending out little packages of spring promise! Are you a member of APS? You know, I never noticed the Christmas tree in the leaves before. No wonder we get them at Christmas! Well, maybe, but more likely when they get forced into bloom. 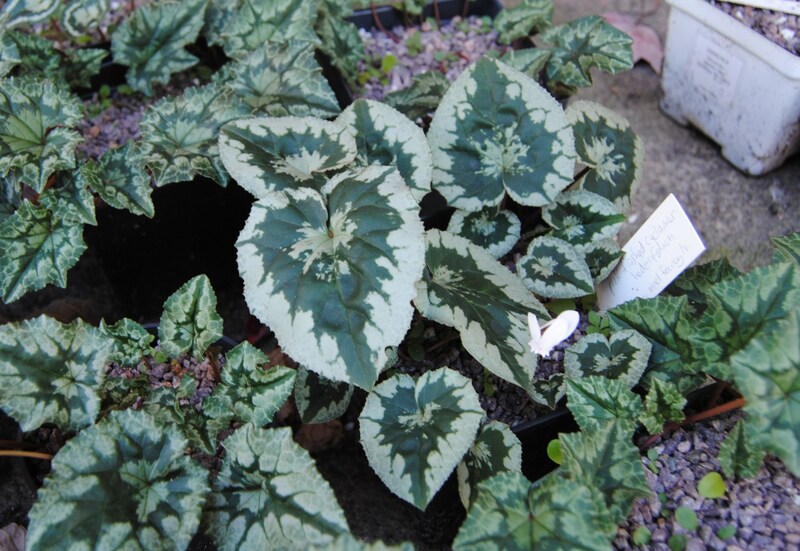 I am going to have to check out the begonias now for a Rorschach ink blot test! 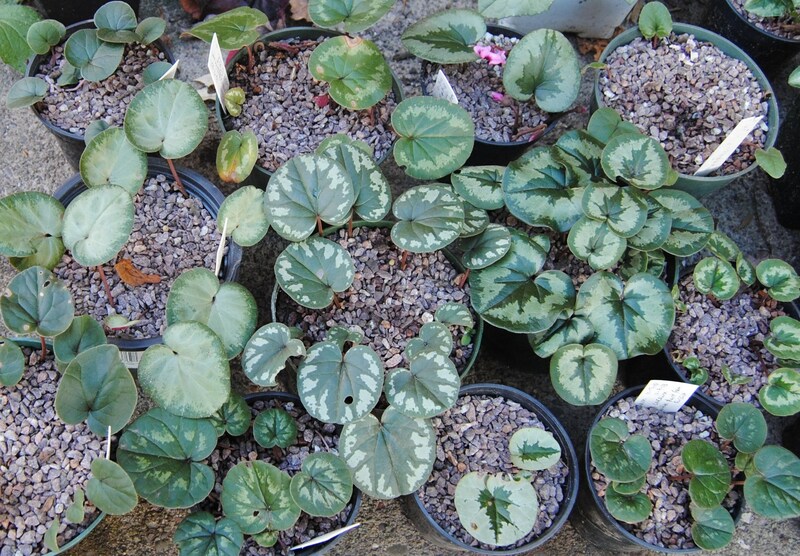 I’m loving your Cyclamen collection – they are wonderful and a real credit to your hard work and efforts. 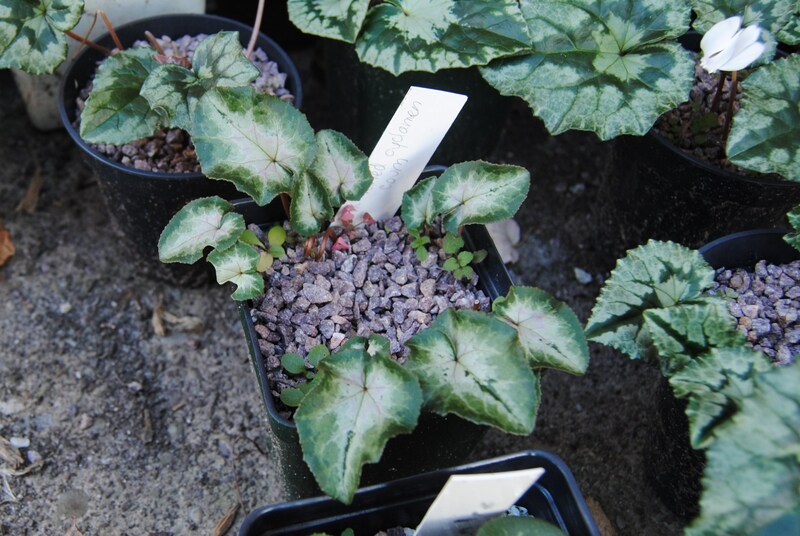 I was recently gifted some Cyclamen pururascens – too young to flower but I’ve high hopes! Ah thanks, and good for you! I have a single purpurescens that will bloom any day now. This will be the first that made it so far although I have a few tiny seedlings coming along. I think I may have been pampering them too much in the garage when what the really wanted was a cold harsh winter outside…. if that’s what they want I’ll oblige! You certainly can’t hide your love for cyclamen and why should you. They are so pretty and I’m very happy to see mine making their first steps into the world. Hopefully -with the help of the ants- in a few years I’ll have a nice liitle carpet like you do. It’s wise not to stick to what others tell you all the time as plants are far more forgiving than we think. I’m glad to hear yours are settling in, and they do seed out quite a bit when happy. I bet you’ve seen the springtime pictures of carpets of c. coum blooming with other spring bulbs (or maybe you’ve seen the real thing!) That would be a goal for the ants to work on. I’d be happy with a carpet of my own, or even a little door mat of color! 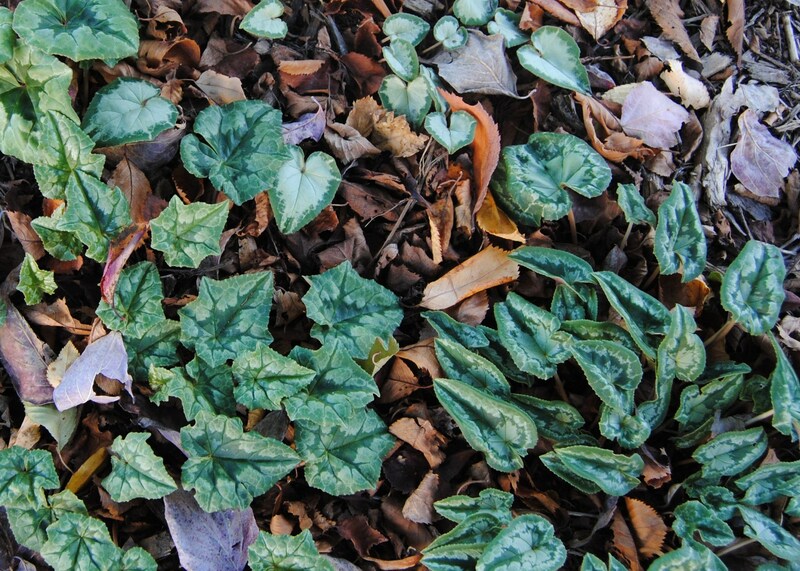 The foliage is very nice, but I love the cyclamen flowers. Feel free to post about the cyclamen as much as you want! I’m in zone 5, maybe I should try some of the fall blooming ones? You most definitely should! It might be a year or so, but when I get some seed I’ll send a few your way for experimenting. Really beautiful! I know the flowers are lovely, but I also love the leaf patterns. Thanks for sharing and for the information! Hi Kevin! Thanks for visiting, I’m always going back and forth between liking the foliage or liking the blooms more.